The highly anticipated free-roam adventure game inFamous has finally arrived but will it be able to live up to the massive hype surrounding it? The Ray Shard: inFamous begins after a mysterious blast in Empire City engulfs the metropolis and all in the city, leveling an entire city block, killing everyone walking its streets. Everyone else on the street died when the blast occurred, but for some reason you survived and managed to make it to a hospital. You assume the role of Cole, an extraordinary person who, after the blast somehow developed strong electrical powers. As time passes, Cole learns to manage, to control these unusual powers. After the blast, Empire City was plunged into chaos. People who were formerly simple Gang members took control of the city and formed a group, the "Reapers" who place each citizen at their mercy. The denizens were plagued with disease and fearing an outbreak the Government locked down the city, forcing everyone inside its walls. Eventually, an FBI agent finds out about your powers and cuts you a deal. Help her find her husband, who disappeared while working on a project that would provide a single individual with power similar to Cole's, and she will let you out of the city with no questions asked. The story of inFamous is quite good and relatively easy to follow as you guide Cole through his adventure and there are some plot twists thrown in to keep you wondering what's next. Eating Lightning: The gameplay of inFamous focuses on using your electrical abilities to interact with your environment as well as exploring the open world. Everything from attacking enemies and moving objects to healing injured civilians and recharging yourself from a power grid can be done in your spare time. During the game, you will be able to shock and electrocute near everything in the city. The interesting thing is that everything you shock will react to your action. If you fire off at a fence, it will become electrically charged. Drain power from a sign and it will fade and eventually shut off. In combat, you have a variety of options with which to dispatch your opposition. You can use your fists, attack them from long range with your lightning strike or even knock them off buildings with your push attack. Your powers are very fun to use and even though it may sound uninteresting to only be able to use electrical powers, they do not get boring at any time and it is very easy to spend a load of time simply experimenting with the environment using your abilities. As far as exploring the city, honestly there is not much to do besides fighting enemies and completing missions. All there really is to do it climb buildings; find missions or battle against some hordes of enemies. For a while it can be fun just jumping from building to building in an Assassin's Creed-style of exploration, but after a little while there is a feeling that there should be more to do. Have We Met: Each time you kill an enemy, complete a mission or do pretty much anything else of importance you will earn Experience Points, or "XP". You can even earn more points by killing your enemies in unique ways such as "High Fall" or shooting them while airborne. You can use the XP that you earn to upgrade your abilities to make them considerably more powerful. You can increase the power of your default attack, how much damage you can take, how strong you are overall or even buy new powers outright such as a "Shock Grenade". These new powers as well as upgrading the ones you already have add a nice level of depth to the game and it also helps limit you so the game is not too easy at any point or time. Which Side: A large focus of inFamous is making a number of choices throughout the game that determine how you will be looked at, your appearance, your powers and how the story progresses. Throughout the game you will be tasked with picking to make either an Evil choice or a Heroic choice. These choices are often deep and the game requires you to look at the consequences of your action. Take for example one of the first choices you make in the game. Will you take the Government dropped food for yourself and your friends by frying a few people in the crowd to cause a scare or let the people of Empire City take the food? Eventually you will become either a "Hero" or "InFamous" and as such the populace of Empire City will look at you differently. Sometimes they will even throw rocks at you! Sweet 720p: For some odd reason, perhaps Naughty Dog could not get inFamous running right in any other way, infamous only runs in 720p video quality. Not to worry though, as the game still looks brilliant and has some of the most highly detailed environments I have ever seen. Everything in the city is masterfully designed and insanely realistic but there are some times where you can see the occasional jagged edge or out of place pixel. In addition, the visual effects of your powers are very impressive and the look of the lightning flowing from your fingertips is very sharp. Music To My Ears: inFamous also features some of the best voice acting in a PS3 title. Everyone in inFamous has a great voice over and the dialogue is greatly done helping to immerse you in the game. 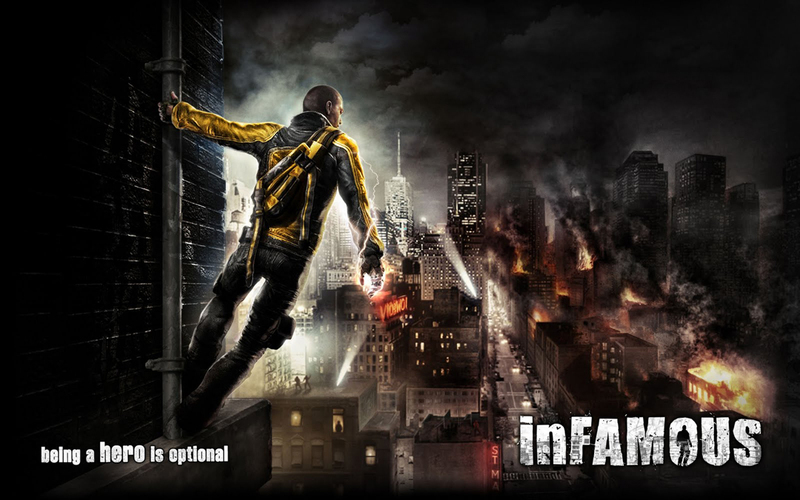 Unfortunately inFamous showcases a minimal amount of music and instead tends to use a subtle tone of music to keep inFamous's as realistic as possible. Rent vs. Buy: Overall inFamous is a great title with many things going for it. It's one of the best free-roam games available on the PS3, even despite the slight lack of things to do in the world. From the impressive visuals and great voice acting to the engrossing gameplay and well-done storyline most near everything about inFamous is phenomenal. Under nearly all circumstances inFamous is a must-rent and if you find yourself enjoying the game then there is no problem picking this title up.